I have been knitting a lot for the past half-a-year, and really not crafting very much. So just to get me going, I had to pick out some challenges... and Paperartsy always has interesting topics :) This was quite an easy one, Aqua, and I took my inspiration from the challenge post = simply the beautiful colour and the fact that I had a suitable starting point in my junk drawer. I started with a piece of glossy card coloured with alcohol inks. No idea how long it has been lying around! 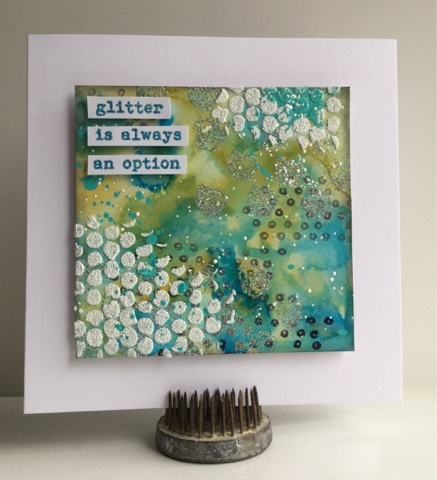 I stamped with Ellen Vargo stamps, embossed with Wow embossing glitters, used some texture paste and splattered paint. The sentiment is from an Emma Godfrey set. 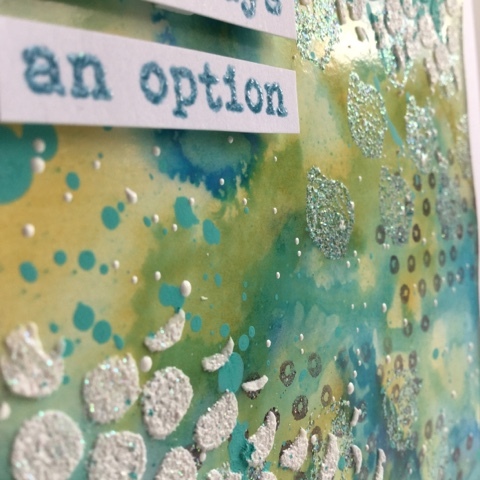 This closeup is trying to show of the shimmer of the embossing glitters. I used "Under The Sea" with Versafine ink and "Sparkling Snow" on the texture paste. Ohhh Kristiina this is beautiful! The depth is striking and it sits so perfectly on the white card! Stunning!